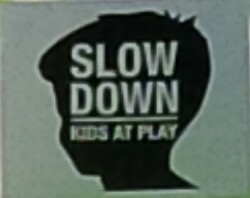 On Friday Metro Morning’s Matt Galloway interviewed Roger Cattell about the slow down campaign that emerged in response to last month’s death of Georgia Walsh, a 7 year-old who was struck and killed by a car in the Leaside area of the city. If you haven’t heard the entire interview, I suggest you click on the above link. For the purposes of this post, I just want to excerpt a few quotes from Mr. Cattell (except where noted), hopefully without de-contextualizing them. Matt Galloway: This has come out of something terrible, and yet has led to a larger conversation, and a sense of true community in this neighbourhood. This shouldn’t be seen as any sort of criticism of the grassroots activism that seems to be emerging from this incident, particularly with Roger Cattell and his neighbours. It’s more of an instructive assessment, let’s call it. In the hopes that it won’t take another terrible situation to spur more of us into civic action. We really need to cease designating people for the role of ‘social activists’. In a vibrant democracy, all of us would be ‘social activists’. That’s not to say everyone needs to get involved with every issue that arises. But for this issues that truly matter to you? Don’t expect someone else to do the legwork for you, including your elected representatives. The fact is, Toronto’s Board of Health raised the issue of reducing speed limits a couple years ago, receiving something of a chilly reception to the idea from the likes of Mayor Ford and Councillor Denzil Minnan-Wong. Their report took a backseat, if you’ll pardon the pun. What might happen to it if a group of determined ‘social activists’ started making noise and demanding action? “… I do find local politics a bit too embedded in administrivia,” Mr. Cattell states later. What exactly is ‘administrivia’? I mean, I get it, a funny little made-up word that denotes boring and useless tasks of administration. But city government is nothing if not ‘adminstrivia’. It is about the mundane, day-to-day slog of trying to make sure the city functions properly, including the determination of speed limits on city streets. It ain’t pretty but somebody’s got to do it. This is where I’ll take the most exception to Mr. Cattell. Flush your toilet, step out your door, hop in your car and drive to work. None of this is possible if nothing gets done. Much gets done, each and every day. We just sometimes stop noticing because we take many of those things for granted. Politicians, especially local ones, do not operate in a vacuum. It is their job to try and keep as many people as happy as possible. Some of it is self-serving. Happy residents make for content voters. But it’s also the nature of democracy, creating a consensus based on competing interests and the best evidence available. If you remain on the sidelines, finding the ‘social activist’ dress ill-fitting, you forgo any influence. A voice heard only every four years is listened to only that often. From the large buffet of damage done to governance in Toronto by Rob Ford, the customer service item is a pretty hefty one. This idea of voting for a politician and then only getting involved with a phone call when something’s not working for you is a smiley face on dysfunctional civic engagement. It’s reactive democracy, a one-stop runt of resident participation. You got a problem, folks? Give me a call. I’ll pretend to sort it out and we can all pretend that’s how democracy is supposed to work. This entry was posted on Wednesday, August 20th, 2014 at 1:38 pm and is filed under CBC, City Building, City Council, Elections 2014, Killer Cars, Municipal Politics, Newspapers, Press coverage. You can follow any responses to this entry through the RSS 2.0 feed. You can leave a response, or trackback from your own site. As a relative “newbie” to City Hall (*I made my first-deputation in Dec. 2011 – yes, about an “in my neighbourhood” issue), I can totally relate to Mr. Cattell. First, you’ve got lives, work, family, etc – unless things at City Hall are (a) Totally off-the-rails, (b) Directly effect you, and (c) get some Media attention…you are unlikely to know any of the details of the day-to-day machinations at City Hall. Sure, it’s a half-assed version of Democratic-Participation, but that’s ALL most of us have time for. We’ve “delegated” our votes to Councillors, and expect them to just deal with whatever it is they are supposed to be dealing with…. We live in a Media-World on a Branded-Planet, and “social activist” (*just like “Ford Nation”) is a Brand with baggage – which instantly reduces the number of people who are willing to listen to the rest of what you have to say. Third, as an outsider – “administrivia” is a Grade-A word for the way things are done at City Hall. The system there is Hard-Wired to enforce and reward “Process Over Progress”, and “Operations Over Outcomes”. Navigating Councillors, Staff, Media, Clerks, Committees and Process to actually ACCOMPLISH something is almost impossible. Sure, if you are willing & able to take a day (or two) off work, go to City Hall, sit around all day, and hope for Quorum – THEN you can have your 3 to 5 minutes to depute (and generally “pi$$ into the wind”)…but to actually CHANGE the way the City of Toronto does something (*other than a speed-bump or a fence-variance) is almost impossible. The system is designed to either (a) Grind you down, or (b) Pat you on the head & send you on your way with the “warm-fuzzies” that at least you tried. Those non-government actors (ie. Lobbyists, Pressure Groups, etc.) who already know Councillors, Staff, Media and Process have an overwhelming advantage in that Forum – because they have the Time, Money Resources and Patience to engage (and wait-out) the lumbering-Behemoth that is City Hall. …and the crew at City Hall smile, pat us on the head & send us on your way with the “warm-fuzzies” that at least you tried….AND thank us for the contact-details that will be very-useful during the Fundraising-Cycle of the next election.